As a gardener, I should be more knowledgeable about the evolutionary story of seeds. Sadly, it is a topic that I am sure most of us have ignored or simply taken for granted. When we think of seeds, it is in the spring when we plant them, eat them (pulses, legumes, grains, and nuts), or harvest them for the next growing season. We certainly aren’t thinking about all the ways the evolution of seeds have contributed to our daily lives, in our diets, to our economy, or even to the development of our civilization. 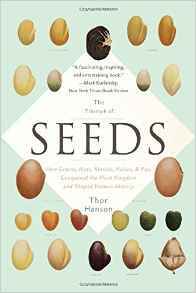 Thor Hanson has written a fascinating book about the history of seeds, a surprising adventure story from the expertise of both a field biologist and a great storyteller. 360 million years ago, dominant plants such as ferns did not flower but reproduced via spores, producing gametophytes that in turn made the eggs and sperm necessary to produce a new fern. But by the Cretaceous era, 145 million years ago, flowering plants dominated the environment. The advent of flowers, with their pollen, could reproduce in much easier ways (pollinators and wind), producing seeds that could be dispersed more than a few inches from the mother plant. As flowering plants evolved, pollinators evolved, and other animals who relied on the plants and their seeds helped disperse the seeds, also evolved in an incredible story of co-dependence. It is the story of this flower-pollen-seed production and dispersal that has ‘made all the difference,’ to quote Robert Frost. Hanson takes us on a journey through the earth’s distant past, from paleobotanists (experts in fossil plants such as ferns), to evolutionary botanists such as Charles Darwin and Gregor Mendel, to the research of scientists today in their search to understand the secrets of seeds. Hanson recounts the cultivation of grains and pulses for food stability, how scarce food in times of drought could lead to the possibility of war or revolutions -- not only in the past, but also today. Newly discovered seeds had great impact in the Age of Discovery when explorers of the New World brought new seed species back to Europe (think chocolate, excuse me, the cacao bean). Hanson tells us how the roasting of coffee beans and the popularity of coffee houses impacted The Enlightenment. In the Industrial Revolution, the invention of a mechanical way to separate the seeds from the fibers of the cotton boll lead to significantly increased cotton production that, in turn, lead to our own Civil War. The shape of Javan cucumber seeds impacted the design of the stealth bomber. The natural history of seeds has been deeply intertwined with our own human history; without seeds we may not have evolved to our dominant place on earth. Seeds have given us the ability to grow our own food, moving beyond hunting and gathering. Seeds are the secret of plant life, and without them, our lives would be impacted in a negative way. The author writes, “All the elaborate and remarkable features found in seeds—from nourishment to endurance to protection—will persist only so long as they benefit future generations. Seeds embody the biology of passing things down. In a sense, that is also the root of their deep cultural significance. Seeds give us a tangible connection from past to future, a reminder of human relationships as well as the natural rhythms of season and soil.” I like the thought of the natural rhythm of season, soil, and seeds. Thor Hanson is an author and a conservation biologist. He is a Guggenheim fellow, a Switzer Environmental Fellow, a winner of the John Burroughs Medal, and two Pacific Northwest Book Awards. He is the author of Feathers and the Impenetrable Forest.